Canicross is a dog sport that first became popular in mainland Europe. It originated as a method for exercising high energy sled dogs, like Huskies, when "mushing" was not possible. It involves hooking your dog up to a specialized running harness and attaching this to your body with a hands-free leash so that you can run together. The sport is well established across Europe, and there are numerous canicross clubs and regular competitive races. While it is still relatively new in the United States, it is growing in popularity. It is a great way to increase your fitness, keep your dog healthy and happy, and develop your bond. Do I Need Any Special Gear to Canicross? As long as your dog is in a well-fitting harness, you can give canicross a whirl without any special gear. Never run with your dog while they are just wearing a collar as it puts too much strain on their neck. If you think it is something you want to pursue more seriously, investing in proper equipment is recommended. If you can join a local club, not only will they be able to advise you on techniques, but they may also carry some club gear, allowing you to see what works best for you and your dog. We've put the basics below. These are designed to provide greater all over body support to your dog when they are pulling out front. There are lots of brands on the market and some sit better on certain dogs than others. A short traffic leash or a retractable leash is not going to cut it. You need a hands-free leash that is not so long that you could get wrapped around things or tripped up and, preferably, it should be a bungee leash or have a bungee attachment to prevent any harsh jerking action at high speeds. It is okay to opt for a leash that clips around your waist, but a lot of serious canicrossers use a harness or wide belt for extra comfort and support. It is similar to a climbing harness: you step into it, and it supports your hips and pelvis. Having a belt or rucksack that can hold water is useful, it should also have room for a portable travel bowl for your dog. Don’t forget some dog waste bags, too. It is a great sport for most dogs. Some breeds are natural canicrossers, like Huskies, but, even breeds like Chihuahuas have been known to get involved and love it. There are a few exceptions though. While your puppies bones are still growing, it is vitally important they are not over-exercised. Canicross is not appropriate until your dog is fully grown, so generally over a year old or even 18 months for large breeds. Many senior dogs are exceptionally fit and healthy and may be able to continue running into their golden years but, it is important that you judge sensibly when retirement may be most appropriate. Even if your dog loves it, if they are showing any signs of being lame, in pain, stiff, or they have been diagnosed with arthritis, then it is time to find a lower impact activity to keep them happy. If your dog is recovering from injury, they need time to recover fully. Reintroduction should start with approval from your vet and it needs to be gradual. If your dog has had major surgery, they may never be able to return to canicross due to the risk of re-injury or pain. If you have a brachycephalic, flat-faced breed like a Pug or a French Bulldog, it is likely that canicross will not be a suitable activity. Because they often already have issues with breathing and regulating their temperature, the strenuous exercise could put them at higher risk for injury or breathing issues. If your dog is overweight, they need to go on a diet and a moderate exercise plan. Canicrossing, when a dog is too heavy, can put extra strain on their joints, and they are more likely to have issues with regulating their temperature and getting out of breath too quickly. If you have recently adopted a dog that is nervous around other people or dogs, you need to consider how you introduce canicross. Exposing them to a busy club environment might be too much, and they may need to run one-on-one while you build up introductions. Many clubs are very considerate when it comes to nervous dogs, ensuring they get plenty of space and positive introductions. If your dog is uncomfortable, do not force it. 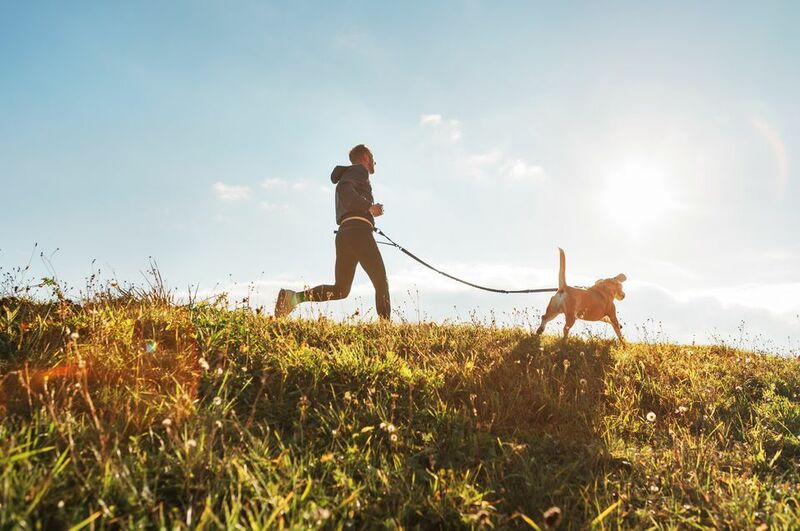 In the scorching temperatures, any strenuous exercise is inappropriate and with canicross, even a slightly warmer day can result in your dog suffering from heat stroke. Make sure that your dog is always well hydrated, kept cool, and prevented from running when the temperatures are too high. What Are the Basic Techniques of Canicross? You ultimately want your dog to pull out in front but, some dogs, especially if they usually walk very well to heel, may automatically run alongside you instead. You can encourage them to run ahead by having another runner in front and giving them lots of praise and encouragement when they do. You can also work on a cue to ask them to go ahead and reward them every time they do it. Some people worry that the pulling in canicross will make a dog pull on regular walks. As long as you keep up consistent training and commands, this is not likely. Most dogs understand the difference between a canicross harness and a normal one. Once you both have the basics sorted, you can start to introduce additional commands, including those used to slow down, stop, move left or right, or pass another runner.